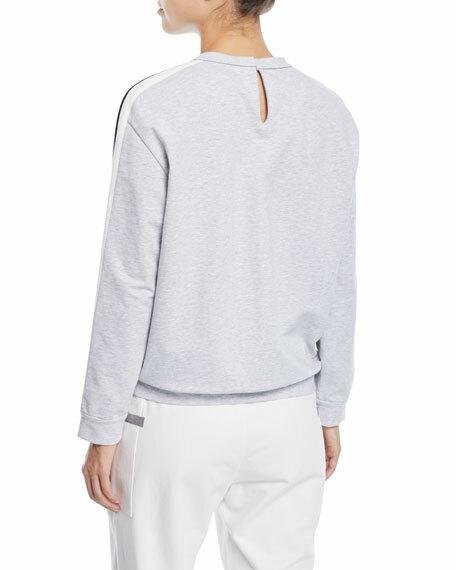 Brunello Cucinelli sweatshirt with varsity stripe down arm. Escada Sport logo sweatshirt. Crew neckline. Three-quarter raglan sleeves. Logo wordmark stripe across chest. Oversized fit. Rolled hem and cuffs. 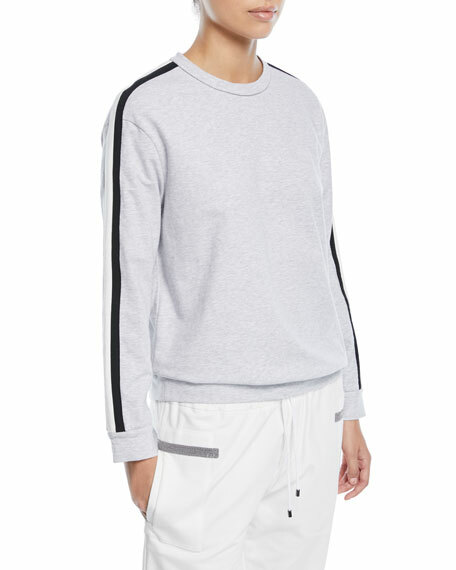 Escada Sport logo sweatshirt. Crew neckline. Three-quarter raglan sleeves. Logo wordmark stripe across chest. Oversized fit. Rolled hem and cuffs. Pullover style. Cotton/cashmere. Imported. LNDR "College" sweatshirt in soft stretch-jersey. Retro-inspired bouclé logo. Two front pockets; back patch pocket. Drawstring hood. Long sleeves. Relaxed fit. Pullover style. Cotton/nylon/spandex. Machine wash. Made in Portugal. Majestic Paris for Neiman Marcus sweatshirt in signature soft-touch French Terry. Approx. 24"L down center back. Crew neckline. Long sleeves.